We got up and headed to Disney springs this morning, it was really quiet when we arrived around 10.10am. We had a wander up to Disney quest then back down to the main shopping area. We decided on D-Luxe burger for lunch. 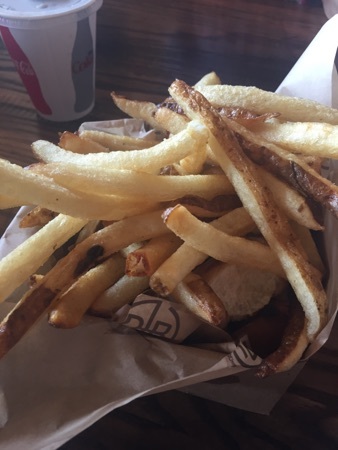 DD had a kids cheeseburger, the burger is in there, it's just buried under the fries  DD really enjoyed this and there were loads of fries for a kids portion. This came with a kids soft drink too for the price. DH and I both ordered the bacon and blue burger, this was a beef burger with bacon, lettuce, tomato and blue cheese. It was cooked medium and absolutely delicious and so huge! 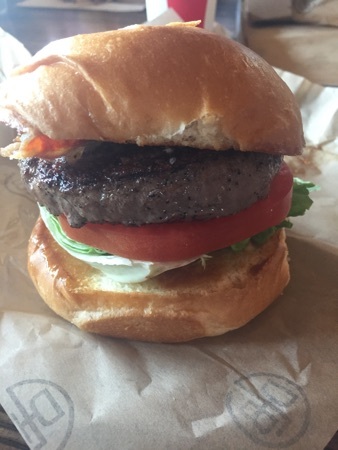 The burger was cooked perfectly and really moist. This on its own was very filling! 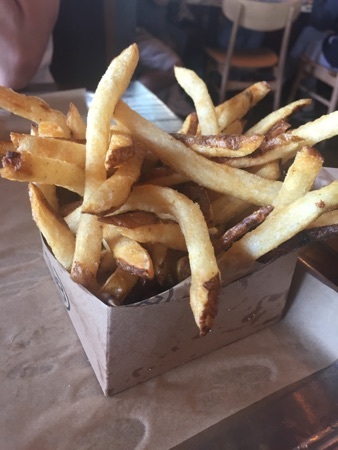 We ordered a regular side of fries with our burgers to share, we thought they were quite expensive at $4.99 but you got loads and to be fair we didn't really need them on top of the burger. They were lovely though, love fries that have the skin on. 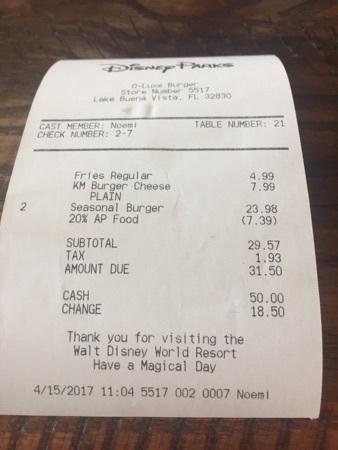 D-luxe burger does passholder discount so we got 20% off bringing this to $31.50. 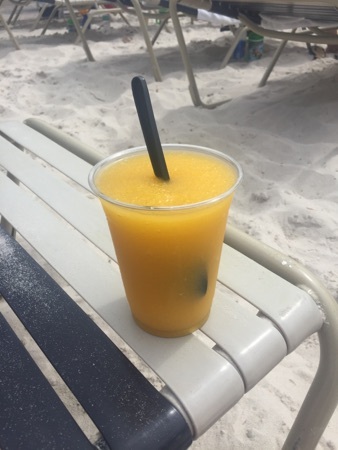 We spent the afternoon in typhoon lagoon where I got another passion fruit slush! These are so good! DD finished most of this when she got her hands on it. For dinner this evening we headed to Kobe steakhouse, we can actually see this place from our room at the Clarion so headed over to try it out. It's a hibachi restaurant very similar to teppan edo in epcot. We ordered our meat and the meal was served in various stages. 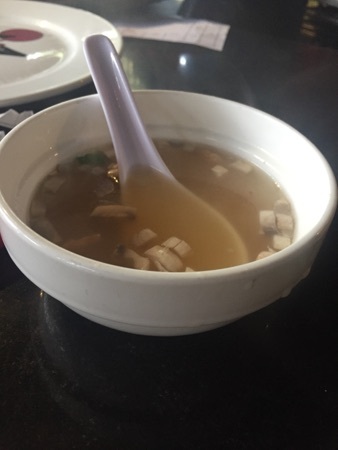 First up was an onion soup, this was nice, it was onion broth with onion and mushroom pieces in. 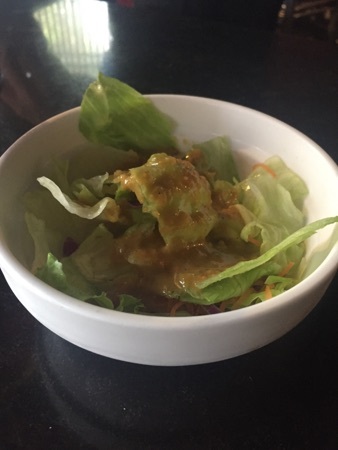 Next they served us a salad, this had a soy and ginger dressing and was very nice. 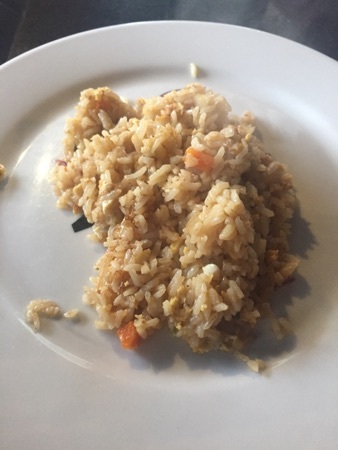 The chef then prepared egg fried rice on the hibachi grill. This was really good with plenty of flavour. 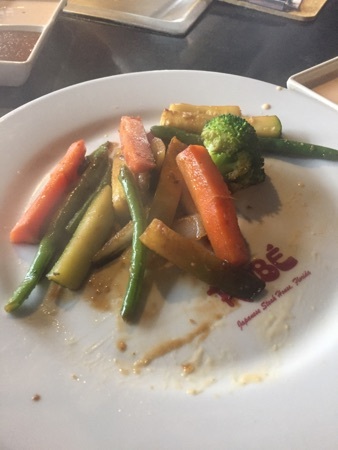 Then it was the vegetables, there were courgette, green beans, broccoli, onion and carrot. 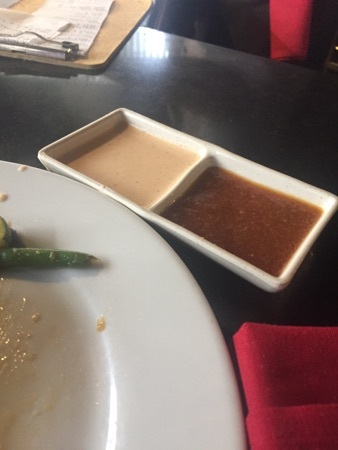 The chef gave us 2 dipping sauces with our meal, the brown one was soy and garlic intended for meat and chicken and the white one was yum yum sauce to go with fish. Both of these were really good, especially the yum yum sauce. 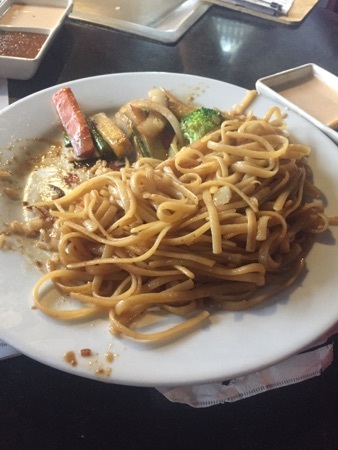 Next up was the noodles! These were very tasty and there were loads of them! And finally the meat! DH and I both ordered the sirloin steak, this was a 6oz serving each. DD had the kids chicken. We had our steak cooked medium rare and it was so tender and melt in the mouth, absolutely delicious! This came to $63 for the 3 of us, we each got a Coke to go with our meals too which they refilled regularly. 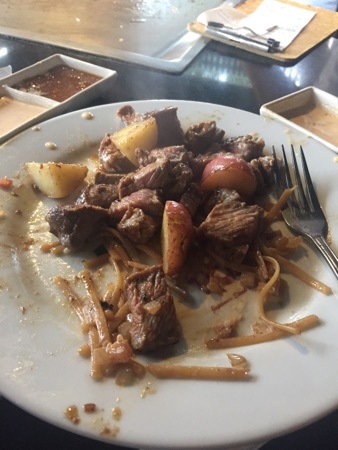 We thought this meal was fantastic, the show while cooking was just as good as teppan edo and the portion size was much bigger! We will definitely come to Kobe again in the future! New Photo Added by missdopey - 16 Apr 17 3:07 AM.